The usual caveats warning against generalizations aside, it’s safe to say that in the arts as in other fields of life, the second half of the twentieth century was an era of improvisation. Encouraged by the dissemination of ideas introduced by Zen Buddhism, Existentialism, and A. N. Whitehead’s process philosophy, avant-garde painters, poets and musicians turned to improvisation as a way of engaging art and life in a spirit of spontaneity. 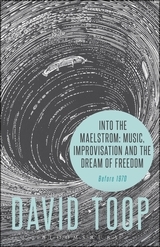 In Into the Maelstrom: Music, Improvisation and the Dream of Freedom: Before 1970, David Toop examines the upsurge of improvisation within the music of the postwar period. The book, the first in a projected trilogy of volumes on free improvisation, is the result of the author’s long experience and intimate familiarity with its subject. Toop, who has written extensively on new and experimental music, describes himself as a being “a listener since 1966, a practitioner since 1969” (30). Culturally, the period Toop focuses on—prior to 1970 and with most attention to the decade and a half before that year—was marked by much ferment. After the end of World War II, philosophical, compositional and technological developments all fostered a rethinking of how and why to make art; one concrete development of this rethinking was a growing interest in improvisation. Largely in America, a fascination with extemporaneity in thought and action grew out of the vogues among artists and others for Zen Buddhism, Existentialism, and the process philosophy of A. N. Whitehead, all of which contributed to the idea of art and life as an ongoing becoming made up of perpetual, open-ended, freely chosen action. In a Europe devastated by the physical and moral destruction brought by war and repressive governments, there was a felt need to start over from nothing. In music, this “Year Zero” mentality led first to serialism and soon after to aleatory and indeterminate forms of music—some of them the product of cross-pollination by visiting American composers–that to varying degrees effectively involved improvisation. Finally, the broadened availability of emergent technologies for sound production and recording, such as magnetic tape, helped provide access to a set of sonic possibilities that hadn’t been practical before. Free improvisation, which Toop describes as “a music without score, notation, image or text, composer, director or conductor” (15), fit this postwar spirit well, becoming an increasingly formidable presence in the art from the 1950s forward and particularly flourishing in the mid-to-late 1960s. As he shows, though, its foundations had been laid earlier. Surveying what might be termed the non-musical pre-history of free improvisation, Toop calls attention to early examples of “collaborative spontaneity” (83) congruent with, if not influential on, improvisation in music: Japanese linked poetry, the simultaneous cacophony of Dada evenings, Surrealist automatic writing and drawing, stream of consciousness prose. At the same time that Dada and Surrealism were doing their best to scandalize the Parisian art world in the 1920s and 1930s, experimental musicians and composers like Henry Cowell and Harry Partch were inventing instruments, tunings and techniques that expanded the universe of sounds available for musical use and raised the possibility of changing or displacing conventional notions of what technical proficiency might consist in. By the late 1930s, improvisation was becoming a larger presence within musical practice. Toop describes some of the “tentative steps” taken toward free improvisation during this period: Charles Ives’ recordings of 1937, Django Reinhardt’s “Improvisation” of 1938, the free duets of Roy Eldridge and Clyde Hart. Staying within the jazz tradition, the 1940s saw Lennie Tristano and his students delve into free improvisation; the 1950s and after brought the fecund experimentation of Charles Mingus’s Jazz Composers Workshop, the Chico Hamilton Quintet, and Jimmy Giuffre’s various trios. Profound experiments by Chicago’s AACM, the New York Art Quartet and musicians like Sun Ra, Albert Ayler and Cecil Taylor pushed jazz-rooted music in radically new directions into the 1960s. Among classically-trained musicians, the 1950s saw the development of improvised music out of the formal language of avant-garde composition and rapidly expanding methods of instrumental technique. In 1957 or 1958—accounts differ–Pauline Oliveros, Loren Rush and Terry Riley, all students of San Francisco State College composer Robert Erickson, played a completely improvised soundtrack to the short film “Polyester Moon.” During this same period, Oliveros, Rush, Riley and Erickson, joined by Laurel Johnson and Bill Butler, recorded a series of fully improvised pieces influenced by the pointillistic, sparsely-textured sounds of music composed after Webern. Not long before these recordings were made, Lukas Foss had organized the Improvisation Chamber Ensemble at UCLA, a group working with free improvisation, graphic scores and conduction; by the early 1960s, the improvisational New Music Ensemble was formed at UC Davis. Experiments with free improvisation were by no means confined to America; they were truly an international phenomenon. In Japan, the classically-trained Takehisa Kosugi and Mizuno Shuko collaborated with the then-untrained Yasunao Tone in largely unscored improvisations during the late 1950s and early 1960s; European groups included AMM, Musica Elettronica Viva and the Gruppo Improvvisazione Nuova Consonanza. Although these groups were geographically diverse there was a degree of cross-pollination among them, and some even shared personnel. By the end of the 1960s, free improvisation had spread to more popular forms of music, most notably through the sound and influence of the West Coast psychedelic bands. The rise and proliferation of free improvisation in the 1960s was an aspect of the radicalization and democratization of the avant-garde culture of extemporaneous action that had taken root during the previous decade, and was seeping into the culture at large. Free improvisation fit the ideological temper of the time by offering “a utopian vision of freedom” (53) as an experiment in ideals of leaderless, egalitarian social organization. Which is still part of its appeal. As Toop appositely notes, it is a kind of collaboration that realizes Sartre’s idea of the group-in-fusion: a praxis or purposive activity taken up by an aggregate of individuals such that each individual’s goals and purposes are subsumed and transformed—are fused into a collective goal–as they are directed toward a common end. It isn’t surprising that some advocates of free improvisation during the mid-to-late 1960s—for example, Franco Evangelisti of the Gruppo Improvvisazione Nuova Consonanza–were motivated as much by ideology as by musical considerations to adopt collectivist solutions to aesthetic problems. This was reflected not only in the makeup of the groups playing music, but in the institutions free improvisers built outside of the existing institutions. Beyond its politics, both explicit and implicit, free improvisation was, and is, compelling as an engagement of some of the basic structures of human existence, in which the very ephemerality of the performance lends it significance. More than once Toop relates experiences—his and others’—in which the musical details of an improvised set are forgotten, while the “human drama” of the improvisers’ interactions with each other and with the audience remain memorable. It’s as if what matters most are the choices made in the moment and the pressures shaping them rather than any given sonic outcome of those choices, or the ways that people improvising together engage each other’s choices as possibilities and obstacles in relation to their own—sometimes at the same time. Toop sums it up with the observation that with improvisation “to play is both a sign and symptom of existence. I am here…” (8). In that sense improvisation is like an image of life, condensed down to its core: The need to act, often without knowing exactly what the consequences of action will be, but making of oneself what one will as one moves into a future whose exact form is necessarily unknown but whose arrival is inevitable. Augustin Brousseloux, Jean-Marc Foussat, Quentin Rollet, Oui A Vu Ce Mystere. . .
As its next installment of free OpenICE initiatives, International Contemporary Ensemble presents a rare performance of German composer Wolfgang Rihm’s hourlong string trio Musik für Drei Streicher. Pianist Marilyn Nonken returns to Miller Theatre with works written specifically for her by two composers: Liza Lim and Elizabeth Hoffman. The concert will include a round­table panel of artists, musicians, and poets, who will be onstage providing commentary. The panel will include Beth Fertig (contributing editor, WNYC), Mark Stewart (guitarist), David Baker (poet), Charles Coleman (composer/­vocalist), and Paul Mills aka Poez (poet). The audience will be invited to tweet their immediate reactions to the music, with the tweets projected live onscreen during the performance. The concert will feature music by Svjetlana Bukvich, Dan Cooper, Melissa Grey, Peter Jarvis, Robert Levin, Milica Paranosic, Gene Pritsker, and Randy Woolf. Pianists Kathleen Supove and Isabelle ‘Izzy’ O’Connell come together for a concert of two piano music, including newly commissioned works by Molly Thompson and Brian Mark. The evening will feature four pieces by composers Andrew Noseworthy and Phong Tran. Noseworthy, a Brooklyn­-based composer, guitarist, arranger and improviser from Newfoundland and Labrador, Canada, will be presenting a work for solo melodica, as well as the world premiere of his piece for prepared horn and tape. Tran is a Brooklyn­-based composer, electronic musician, and visual artist who will be sharing two world premieres: a work for piano and a self-­performed piece for electronics. Solo performances will be by pianist Mika Sawada and hornist Elizabeth Fleming Martignetti. Jaki Liebezeit, drummer and founding member of the seminal krautrock band Can, has died from pneumonia at the age of 78. The band – which was formed in West Germany in 1968 and is widely regarded as one of the most influential avant garde rock groups of all time – confirmed his death in a post to its official Facebook page late on Tuesday GMT. CONTACT! at National Sawdust (Jan. 23, 7:30 p.m.). The New York Philharmonic’s new-music series was very nearly cast aside last year, and it took personal support from Alan Gilbert, Esa-Pekka Salonen, Jaap van Zweden and Matthew VanBesien to save it. Conducted by Jeffrey Milarsky, this wide-ranging program shows why it deserved to carry on. Expect music by Elliott Carter, David Lang, Zosha Di Castri, Alexandre Lunsqui and Steven Mackey. INTERNATIONAL CONTEMPORARY ENSEMBLE at the Underground Theater at Abrons Arts Center (Jan. 23, 8 p.m.). ICE just presented the music of Ashley Fure in a free concert. Free next week is Wolfgang Rihm’s “Musik für drei Streicher,” an hourlong string trio from 1977 of high difficulty and deep expression. Josh Modney, Kyle Armbrust and Michael Nicolas are the players.